Whether you’re giving the bathroom a whole new refit or you simply want to freshen things up, choosing a new window treatment for the windows is a quick and easy way to inject style and even glamour into the space. Most homes will have frosted glazing for privacy so a window treatment tends to be chosen to bring colour or pattern into the room. It also adds a feeling of warmth and gives the perfect finishing touch to your décor. Here's our pick of the best window dressing ideas. Find more window treatment ideas in our dedicated hub, and check out all the ways you can update your bathroom, too. There are endless options available in a variety of fabrics, designs, patterns, prints and colours as well as the different types of window dressing. Roller and Venetian blinds are the most popular as they are easy to install and cost effective. They are also hardwearing with clean, simple lines that sit flush against the window. Made to measure will create the perfect fit and many companies offer a free measuring service. Window shutters are also becoming increasingly popular, as they give full coverage and complete privacy as well as great light control with easily adjustable louvers of varying sizes. Some fabrics are specially designed for bathroom use, withstanding moisture, heat and humidity to prevent the appearance of mould and mildew. Where extra privacy is needed however, window film that can be applied straight on to the glass and simply removed and swapped for another frosted film design when you fancy a change. Period properties often come with unusual and interesting shaped windows and it can be difficult to know how to dress them. This bathroom has a large arched feature window, which is perfectly finished with two panels of wooden shutters in a Rustic Grey stain. Available from Apollo Blinds, they have 63mm louvres with nickel hinges and measure W100cm x D150cm. Prices start from £397 per sq m and they can be made to fit almost any size and shape of window. With a top down, bottom up Duoshade Zinc pleated polyester thermal blind from Blinds 2 Go, you decide where you want the opened blind to sit. This made to measure design is energy saving too, as the outward facing fabric is white for improved solar protection. The honeycomb fabric is made from cells coated on the inside with reflective aluminium and it’s also a blackout design for complete privacy. Prices start from £84.50 for W95cm x D130cm. If you know you like to change your window dressings more regularly than most, then a fabric changer system is for you. Its hook on/hook off design allows you to quickly and easily swap the blind for another pattern, print or colour when you fancy a quick room refresh. This Tranquillity Rust blackout fabric from Bloc Blinds is shown on a standard roller blind with built-in fabric changer option for instant fabric updates. It costs from £78 for W101cm x D101cm and also comes with a lifetime guarantee on the barrel system. Give a contemporary or classic scheme a splash of colour with a DIY shutter that features a bold framed design. Available as café style, tier-on-tier or full height, choose from standard paints and finishes or custom colours, with prices from £166 per sq m at California Shutters. You can also select waterproof vinyl as well as a wood hybrid, smooth or grained hardwood. This full height style shown lets you control the light, warmth and privacy as well as adding soundproofing and security, too. 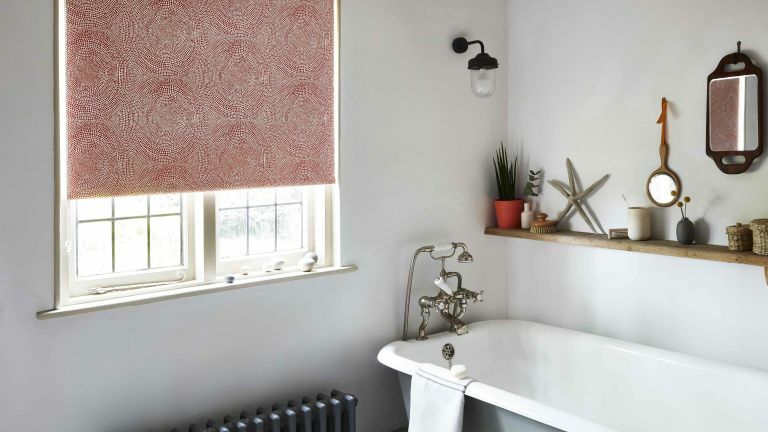 We may not think of using Roman blinds in the bathroom but so long as there’s plenty of ventilation with an opening window and extractor fan, it can create a classy look. This Mineral Aqua design is from Hillarys’ Romans collection and costs from £138 for W65cm x D75cm. Find out more about Roman blinds in our guide. Window film is a fantastic way to achieve instant privacy on clear glazing as well as giving the bathroom a focal point with etched frosted designs. The Window Film Company offers reflective films to combat heat, specialist UV films to guard against fading, frosted window films and solid vinyls with prices from £30 for W75.8cm x D60cm. Their frosted patterns give the appearance of acid-etched or sand-blasted glass and allow a good level of natural light through. Each order is cut to your exact measurements and you choose where you want the design. Ideal for loft conversions where the en suite often comes with the challenge of sloping ceiings, Velux Venetian blinds are the perfect choice for Velux Integra® roof windows. Priced from £76, they are moisture resistant so are suitable for humid rooms and offer privacy, light control and cordless operation. There are nine colours to choose from including Midnight Blue, Charcoal and White with 35mm wide lacquered aluminium slats. One of the easiest options is a roller blind and the heat efficiency and moisture resistant properties of Duette® blinds make them an ideal choice for the bathroom. Their designs can be cut to suit almost every shape of window with a made-to-measure service that also includes an in-home design consultation, measure and fit. Available in over 300 colour, texture and transparency options, prices start from £150 for W40cm x D60cm. Many city apartments and period properties have bathrooms on the ground floor or facing the street, which can leave you rather exposed if the window isn’t frosted. For the best of both worlds, offering privacy and plenty of natural light, cover just half the window with shutters. Café designs from Shutterly Fabulous are a half-height plantation style, which cost from £299 per sq m. Choose their waterproof polyvinyl for maximum durability. Go large with luxury charcoal faux silk textured blackout roller blinds from English Blinds when you need coverage for floor-to-ceiling windows. The custom-made Bartlett Basque design is made to measure for the perfect fit and cost from £47.31 for W40cm x D60cm. Assuming you're not overlooked – and this is often the case in a loft bathroom, for example, leaving the window undressed can be very practical and increase the feeling of space in the room. Find more loft conversion ideas in our design gallery. Look for more bathroom inspiration?